There have been plenty of horror stories about repairmen coming into homes and charging outrageous amounts to fix something. That is why you might hesitate to hire a professional for some maintenance chores around your house. Unfortunately, not everything is a DIY type of job. That is especially true when it comes to junk removal. To get rid of big items you need movers, a truck and the time to drop all that stuff off at designated facilities. That’s not something you can pull together easily on your own. However, if you were to hire professional junk removal service like Junk King Cincinnati, then all your unwanted rubbish can be removed with very little effort on your part. There is nothing scary about that! 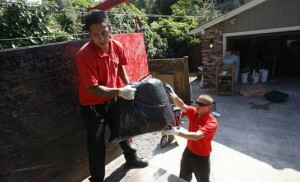 Deciding what you want to get rid of might be the most challenging aspect of hiring a professional junk removal service. Depending upon the amount of clutter it could take you a few hours to sort through all the boxes in your garage and shelves in your closet. Once the decision is made as to what you want to get rid of, you don’t have to worry about putting in a pile on the front porch were down by the curb. When you hire Junk King Cincinnati, their team of quality movers is going to do all the work for you. That means picking up all the junk right from its current location. It doesn’t matter to them if they have to climb stairs to get to what you want to throw out. Their goal is to make sure everything you want removed is gone in as quick amount of time as possible. There’s also nothing scary about setting up your appointment with Junk King. Your schedule is priority. You need to pick a day and two hour window that works best for your time. That can be early in the morning, late in the evening or on the weekend. And if you’re ready to go now, Junk King Cincinnati can also provide same day pickup if they’re in the neighborhood. Think about how your home can be transformed once all that unwanted clutter is removed. All it takes is one session with Junk King Cincinnati to make your home free of junk. This entry was posted in Cincinnati Junk Removal and tagged clutter, Junk King, junk removal on October 22, 2017 by Junk King. Last updated October 22, 2017 .